The relationship between manure and agriculture goes back almost as long as agriculture itself. Now it turns out that with a process known as anaerobic digestion, manure and other biodegradable materials may help farms and local governments recycle organic waste into several farm products, including electricity. Anaerobic digestion is similar to the more familiar composting process, with one key difference. 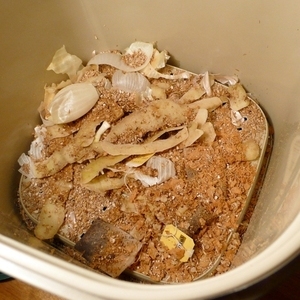 Composting depends on the presence of oxygen to create an environment for beneficial microorganisms that help break down organic matter like manure or food scraps. Anaerobic digestion is different; by definition, it needs oxygen to be absent. It also works at lower temperatures, around 100 degrees Fahrenheit. While both processing methods can be efficient at converting organic waste into a usable byproduct, anaerobic digestion is garnering attention for its potential to transform one abundant raw material into several completely different resources. One of the byproducts of anaerobic digestion is biogas, which includes about 60 percent methane. Though commonly known as a primary greenhouse gas, methane is also an important component of natural gas. If generated in a contained environment, captured, and treated through anaerobic digestion, methane can be converted into natural gas, heat, or electricity. The power potential of organic waste has already lead to collaborations between power companies and dairy farmers in places such as Vermont, where Green Mountain Power’s Cow Power program helps dairy farmers invest in on-farm methane digesters to process their cows’ manure into electricity. The digesters isolate the methane naturally present in the manure and process the methane through a type of natural gas engine, which runs and generates electricity for Green Mountain Power customers. The dairy farms are left with a small amount of partially processed manure that separates into liquid fertilizer and a clean, dry, sawdust-like material that can be recycled as bedding for the animals. The Cow Power program currently works with a dozen farms who, with an average of 1,000 cows each, collectively generate approximately 30,000 gallons of manure every day. With methane from cows accounting for between one quarter and one-third of U.S. Greenhouse gas emissions, finding a way to offset those emissions using those same cows, while also generating renewable energy, has the potential to the climate equation and the way we think about local energy production. So what about also using the same anaerobic process to treat the 133 billion pounds of food waste generated in the U.S. each year? While municipal composting programs seem to be popping up in many places at a steady rate, the production potential of anaerobic digestion to generate fertilizer and power begs the question: why aren’t more local governments trying this method? Some are. New York City plans to open a new anaerobic digestion site on Long Island that will process 160,000 tons of food waste, lawn clippings, and grease into energy and fertilizer, beginning at the end of this summer. And a new centralized facility in southern California expects to process 335,000 tons of food waste per year from Los Angeles, Costa Mesa, Temecula, and Calimesa by 2018. The Zero Waste Energy Development Company has operated a 90,000 tons per year system in San Jose, CA since 2011. But these facilities, while effective, require a significant capital investment in equipment and facilities that many governments may not be able to do, and private investors may not be willing to jump in just yet. Whereas the Cow Power program decentralizes the processing and power generation parts of the process by helping farmers invest in their own digesters at a cost of about $2 million each, large-scale centralized anaerobic sites capable of processing 50,000 tons of organic material per year cost an estimated $20 million, according to research by ReFed. The first phase of the southern California facility mentioned above carries an estimated cost of $25 million. Moreover, in many locations where investment dollars exist and the technology is practical at scale, current policies often incentivize other forms of disposal through low disposal rates and expensive collection. A Canadian government study also concluded that despite a seven-year payback on investment period for methane digesters, the physical components and designs of the systems themselves can lead to sudden and costly interruptions in power generation, complicating efficiency estimates. While these kinks are likely to be worked out as the understanding of large-scale systems evolves, they make large-scale investments in big, centralized systems riskier business, potentially deterring the propagation of these systems at least in the short-term. The result is that only 40 to 50 percent of the 2,000 centralized anaerobic digestion sites in the U.S. are currently dedicated to processing food scraps, according to estimates by ReFed. Reversing the costs of disposal and collection to make the collection of organic waste more affordable, and disposal of valuable organic waste more expensive could be one way to incentivize local governments and mid to large scale businesses to invest in this alternative, potentially important method of recycling and energy production. Proving the technology reliable and efficient will also attract more investors. But many advocates of closing the loop remain optimistic that the hurdles facing large-scale, centralized anaerobic digestion operations are merely symptoms of the early stages of development. Anaerobic digestion has been favored for centuries by Asian farmers processing food waste through the Bokashi method, and investments like those being made in New York and California demonstrate that large-scale centralized systems are accessible to cities and states for those with the political will and courage to prioritize innovative energy projects. As we watch the AD model develop, consider trying your own countertop Bokashi bin to sample the anaerobic process at home.